A few weeks ago, I had the pleasure of attending a themed bar crawl (it was jorts related – also known as jean shorts for those not from the area). Besides the silliness of the theme, the crawl included some essential New England activities such as Keno and Candlepin bowling. Let me address each individually! The Massachusetts state lottery has a very popular game called Keno. What’s great about the game is that it is similar to the lottery – not scratch offs. Players choose from 1 to 12 numbers in a series of 80 and select the number of games they are playing in. Getting 2 to 10 numbers correct within your designated game can award you money. Obviously, the more numbers you match to those randomly selected will win more money. Based on my observations, Keno is everywhere in Boston. From gas stations to convenience stores to grocery stores to bars. Playing in bars seems especially fun as you can watch your favorite sports while gambling with relative ease. I do find this concept interesting because Massachusetts has very adamantly opposed casinos within the state but when it comes to the lottery system, it’s all good. It seems like an interesting dynamic to me as a somewhat outsider. Don’t get me wrong though; I had a blast playing and won $2.00. Jealous? So, disclaimer first. I have a family that has very strong roots in bowling and it was something I grew up with. So when I got to Boston and people started discussing candlepin versus “big ball” bowling, I almost lost it. For those that haven’t played, since it is truly a New England sport, the pins are much smaller and resemble candle sticks. The ball that is thrown down the aisle is also much smaller, and is about the same size as a bocce or skeeball. 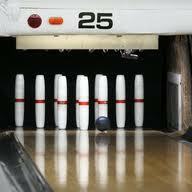 It also seemed that the lanes were longer and more narrow than what I will always refer to as “normal” bowling. Oh, and another important distinction, you get three throws per frame. Candlepin was also pretty fun. However, I was not able to use most of my bowling poses or techniques on candlepin. Since it’s not the same, it took me a while to get the hang of how to throw. I would definitely recommend playing this for any out of towner or new resident – it will certainly make you feel like a native! I will give New England a lot of credit – indoor activities are at a premium and things like candlepin or keno wouldn’t be around still if they weren’t enjoyable. Don't forget your candlepin technique! This entry was posted on Sunday, June 19th, 2011 at 11:26 pm	and tagged with Activities, Boston, Candlepin Bowling, Keno and posted in Activity. You can follow any responses to this entry through the RSS 2.0 feed.